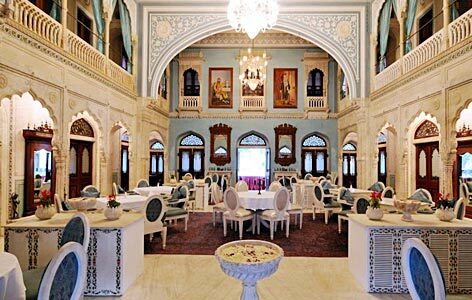 "Chomu Palace truly reflects the splendor and charms of Royal Palaces of India. The historical palace hotel has become a favorite choice of accommodation for discerning travelers to the city. 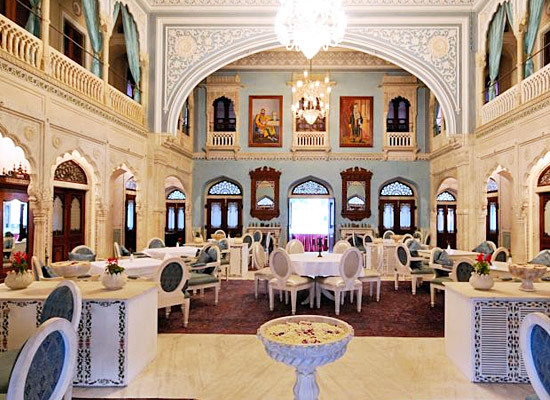 This heritage hotel in Jaipur hotel reboots the royal lifestyle of erstwhile rulers of Rajasthan and stands might and proud as a fine example of the country's heritage. The architecture of this hotel is thought-out as per the styles of Vastushastra philosophy of India. The palace of Chomugadh was established by Thakur Karan Singhji Ji who ruled over the district between 1606 AD and 1621 A.D. It was built as a strategy to design a tall wall to keep the enemies out of the district. All the successive rulers of the district consistently keep making additions and corrections with the fort. The continuous efforts of Raghunath singh Ji and Sukh Singh Ji were successful as the fort was finally finished by 1714 A.D when the district was ruled over by Mohan Singh Ji. It almost took 1000 years for the fort to be completed. It was converted into a Palace by Govind Singh ji by 1901 A.D. The famous Darbar Hall which is in the palace was constructed by Thakur Devi Singh Ji who ruled the district between 1901 and 1937. All the 58 rooms in the hotel elate the guest with elegantly designed aristocratic interiors. 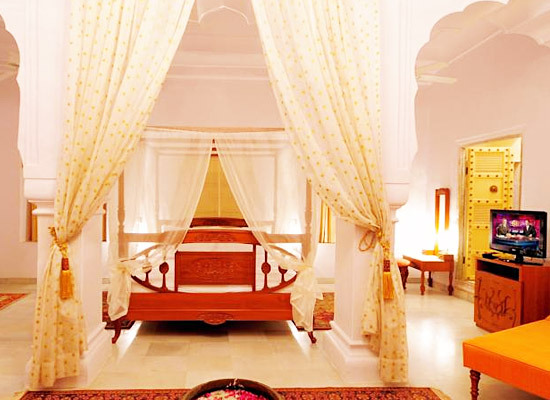 The guests experience a perfect balance of traditional Rajput hospitality and modern amenities. 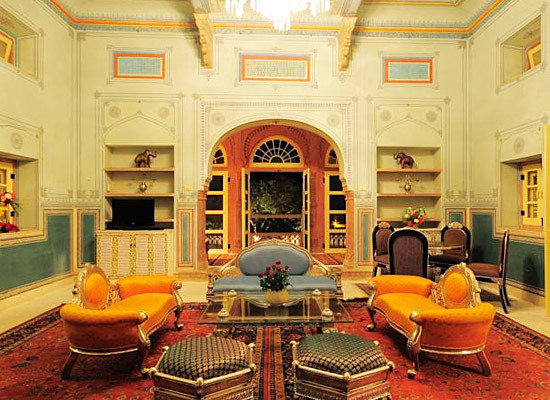 With a stay in this hotel, the guests are brought up-close and personal with the lives of Rajasthan Royalty. The romantic aura in these rooms with antique furniture and spectacular furnishings make one’s stay truly memorable. All the rooms are quite different from each other and redefine the meaning of comfort, luxury and sophistication. Darbar Hall: The multi-cuisine restaurant serves guests with gastronomic Indian and International cuisines. Sheesh Mahal:Tourist visit here to enjoy a fresh assortment of spirits and wines. 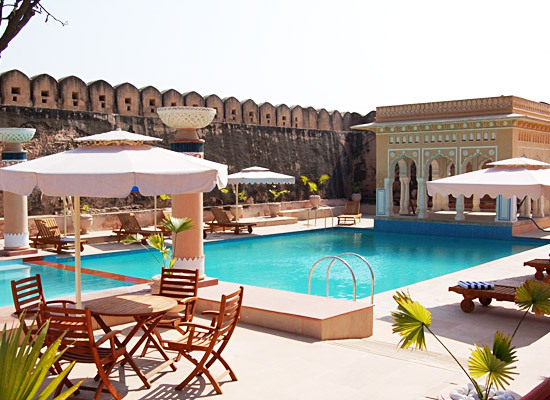 The hotel is located in the small district, Chomu in Jaipur, Rajasthan. Jaipur which is known for some of the best palaces, monuments and forts, attracts tourists from all around the world. Popularly called as Pink City of India, the city is the best visit for those who wish to experience the true essence of the lifestyle that was led by the erstwhile rulers of Rajasthan.